Wash and clean brinjals. Take a flat dish and put water into it. Add some salt to this water. Cut these brinjals into finger sized pieces and dip them in salt water as soon as you cut them. Cut brinjals (some varieties) tend to become bitter when exposed to air, so we dip them in salt water immediately after cutting. Thus the white color of inner portion of the brinjals doesn’t change color to black when dipped in salt water. The un dipped pieces tend to change color and become bitter, spoiling the taste of the curry. Wash & clean ginger, green chilies and grind them to a coarse paste. Wash and clean the coriander and chop it finely. Heat a pan and add oil to it. When oil is hot add the Bengal gram, black gram and fry. Fry until the seeds change color to light brown. Then add mustard seeds and cumin seeds. Fry till the seeds splutter. Now add the ginger chili paste and fry well in oil to minimize the hotness of chilies. Those of you, who want the curry to be a bit hot, may fry the paste a bit less. Add turmeric powder and mix well. Now add the brinjals pieces and mix well. (If you wish you can cook the brinjal pieces in a microwave and add to the seasoning. If you are cooking the brinjals pieces in a microwave oven, first microwave on high power for 5 minutes then stir once and microwave on medium power for 7 minutes. Give standing time 5 minutes before adding these pieces to the seasoning). Add salt and mix well. Cover the pan and cook till the brinjal pieces are cooked well. When you add salt, water oozes out. With that water the vegetable gets cooked. So it is necessary to cover the vessel to cook the vegetable. Once the brinjals are cooked remove the lid and cook for 2 to 3 minutes till the curry is fried well. Add half of the chopped coriander and mix well. Transfer this curry to a serving bowl and garnish with the remaining coriander. Serve hot with plain rice. Here in this recipe I have used Iron pan to prepare this curry. So the color of the curry is somewhat black. Click here to find the benefits of using iron pan in cooking. Dishes prepared in Iron pans change color. If you can ignore the color of the dish and think about the taste and health benefits, I suggest you shift to Iron pans and Tawas. i'm swapna recent ga marraige chesukuni US vachanu, mee site chala bavundi. konni recipes try chesanu they really came out well. mana telugu lo vantaki manchi site unnaduku i'm vv happy. mee receipes lo pachimirapakayalu allam paste use chestuntaru adi ekkuva quantity chesi store chesukovacha. thanks for ur great job. I am a bachelor, working as a software engineer. I have messed up my health by eating outside food, which was too much spicy. Recently, I have decided to start cooking and bought all the reqd items. 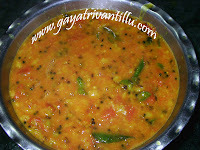 My mother taught me some simple items and last weekend, I prepared vankaya curry by following your youtube video. It came out very well. Amma chesinatte vachindi. Thanks a ton for the video and I appreciate the way you explained the preparation. It was a excellent Blog for the people who is away from family and learners in cooking . I must be thankful to this wonderful blog. Could you please put up some more articles? They are quite motivating. Nenu chaala rojulaninchi mee website follow avutunnanu. Ma gunturu vantalla anipistayi. 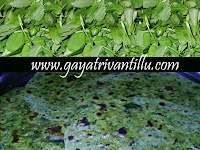 Memu vegetarians kabatti mee website visit cheyyatam chaala truptini istundi. 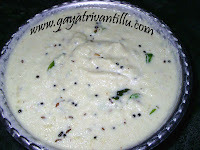 Meeku veelaite madras chaaru, kobbari boorelu recipes post cheyyagalaru. I really appreciate the way you are conducting on this blog. Hats off to you !! !